You will receive free shipping on this item at checkout. Free shipping offer applies to direct website purchases by individual U.S. and Canada customers only. Bulk discounts available for your lab or class. Click here to inquire. eBooks use Adobe Digital Editions software. Click here for more information. RNA (ribonucleic acid) molecules drive much of cellular action. Messenger RNA (mRNA) relays genetic information from DNA to ribosomes to direct the formation of proteins. At the same time, noncoding RNAs act as enzymes, scaffolds, and regulatory molecules, contributing greatly to the regulation of gene activity, RNA splicing, protein synthesis, and even DNA replication. 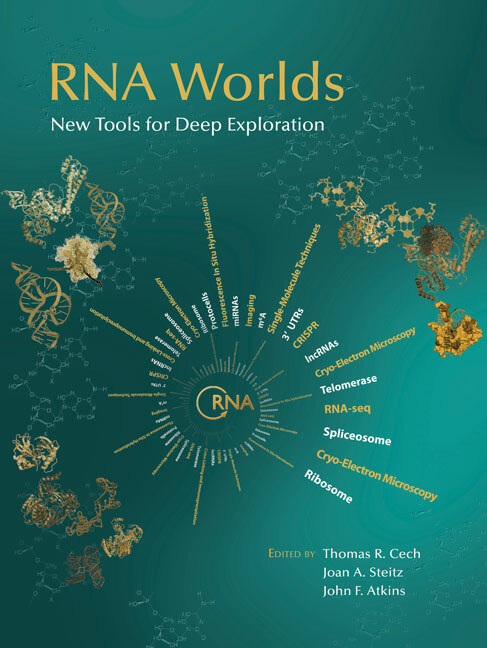 This new edition of the highly successful RNA Worlds series focuses on emerging tools for analysis of RNA biology and how these tools are driving our understanding of RNA structure and function. The contributors review new approaches for imaging RNA molecules in cells, techniques for analyzing the behavior of single RNA molecules in vitro and in vivo, transcriptome-wide analyses, and novel methods for determining the structure of RNA and RNP (ribonucleoprotein) complexes. They discuss the insights these provide into the transcription and splicing machinery, ribosomes, reverse transcriptases, and subcellular structures such as stress granules. Also included are chapters exploring CRISPR editing, RNA switches for use in synthetic biology, and development of novel drugs targeting pathogenic RNA structures. In addition, the book covers recent insights into the primordial RNA World, including protocells and homochirality. It will therefore be of interest not only to biochemists and molecular biologists but to evolutionary biologists pondering the emergence of life on Earth. What Are 3´ UTRs Doing?